Junior B - Played in Clonmel on the 9th June Kells played Mallow from Cork in the semi final after both received a walkover from Dungarvan. 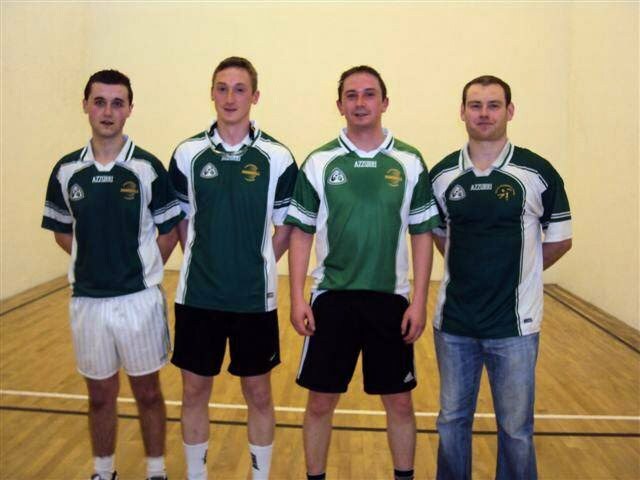 This was a tough semi final with Kells pair Anthony Martin and Dan Breen playing Mallows Dale Cusack and Ken O Neill. Played on a 25 minute format Mallow went ahead early on but Kells finished stronger eventually winning out 29-28 after a tough battle. This left Kells with a one point lead going into the final game where Brendan and Diarmuid Burke faced Mallows Tadgh Carroll and Ryan Harkin. After another great game the Burkes finished the stronger winning 32-27 to book Kells place in the final. In an all Leinster All Ireland final Kells faced Crinkle of Offaly who had easy wins over Curraghboy and Lahorna earlier in the day. In a very high tempo first game Anthony Martin and Dan Breen were defeated by Kevin Cooke and Noel O Brien 44-39. This left Kells 5 points down going into the second game where Brendan and Diarmuid Burke played Sean Ryan and John Mullins ....After a very close game all through Crinkle finished out as champions defeating the Kells pair 33-32.